Photograph of Rani Bibi's Rauza, in front of Malik Sarang's Mosque (Queen's Mosque), at Sarangpur, Ahmadabad in Gujarat, taken by order of Major Cole, by an Army sergeant in c. 1881, for the Archaeological Survey of India. 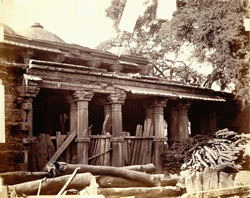 This view of the tomb, or rauza, shows the partially fenced off colonnade with piles of wood in the foreground. The inner area of the tomb has an upper section raised on pillars carrying a dome surrounded by a gallery.